Re: Where in the world #280? Is it a live fish? Was it photographed in open water? Is it done with make-up? Is this still a game about guessing a location? If yes, is it at your home? Yes it is in a location. No it isn't at my home (I wish it was though). OK, is it in a museum then? Is is part of something related to travel and sport fishing? Like in a display case? No to museum or stuffed dead fish. Yes it is a statue. No it isn't in a display case but yes it can be related to travel and sport fishing. Is it in a pub/bar? In a theme park or like entertainment venue? No to either question, although it resides opposite something along those lines. Anything to do with Mr Hogan? Is it in or near (within 50K) the place you live? Somewhere on Australia's west coast? Hubby's out mowing lawns so he's asked me to answer. What she said - mine and a mate's place. Hot now! Yes to P'ter, it is at Swan Hill so no to east coast. 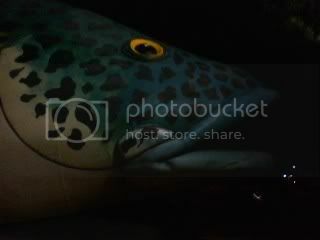 It's the big fish statue of a Murray Cod. One of those things you photograph when travelling. We've been to the big Koala and there's a big rolling pin in one of the towns close to us. Plenty of BIG things around Australia promoting stuff. Well done P'ter. Congrats P'ter, well done. I wasn't even close yet. I saw the big pineapple, years ago but with Qld flooded, a little bit hard to go back and get photos again. I'm glad other countries mark their towns with an icon particular to the district! well it was never intended to be a permanent fixture was it?